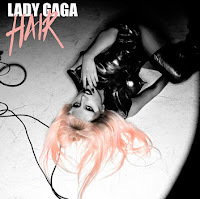 Newly release Lady Gaga "Buzz track" Hair is a song that deals with the themes of acceptance, repression, freedom and creativity all via the metaphor of the songs namesake. Though not exactly Shakespearean in its lyrical composition, the song still has a solid narrative to it that is both endearing and impressive- especially when compared to the poor way similar themes were handled on the terribly literal Born this way. The RedOne production follows the style of past singles Born this way and Edge of glory in being 80's inspired in its melody and structure, whilst taking its club beats from the early 90's. The resulting sound is dated and awkward in its execution but its neither unbearable or offensive. Thankfully the saxophone that mired Edge of Glory, has been pushed far enough into the background as to not be too off putting on the track. Gaga's voice is again on fine form on the track, with nice mixture of vocal stylings and textures to suit the backing track accordingly. The song also features, towards the latter half, some of her most coarse, raw and unpolished vocals on a record. Summary:Vengaboys' We like to party + Alphaville's Forever young+ Brian Adams' Summer of 69 =Hair. Probably my favourite Gaga track released from Born this way so far. Dude, no offence but how can a saxophone be offensive?! thanks for pointing that out. That was a typo and has been removed! Great, The Song is amazing, its just strange that each post about Lady GaGa are more negative than positive. And lead into a bias opinionated post. Not cool bro. @anon If you read my blog posts you would realise I started out praising Gaga from the rafters. My opinion did take a dip with the single choices from Born this way, BUT if you had read my latest post regarding the Hair live performances (here ) you'd see that I've said the project as a whole has really grown on me. I'm not a hater, and won't hate, or love for that matter, something just because its by a certain artist. I just write on what I feel at the time of listening. Its always subject to change and revision of course, but people just need to remember its only an opinion, and you liking/loving the song is just as valid as me or anyone else not.